A volunteer type or graphic designer is needed to help develop a font for a rare script of Kieta district in the Autonomous Region of Bougainville. 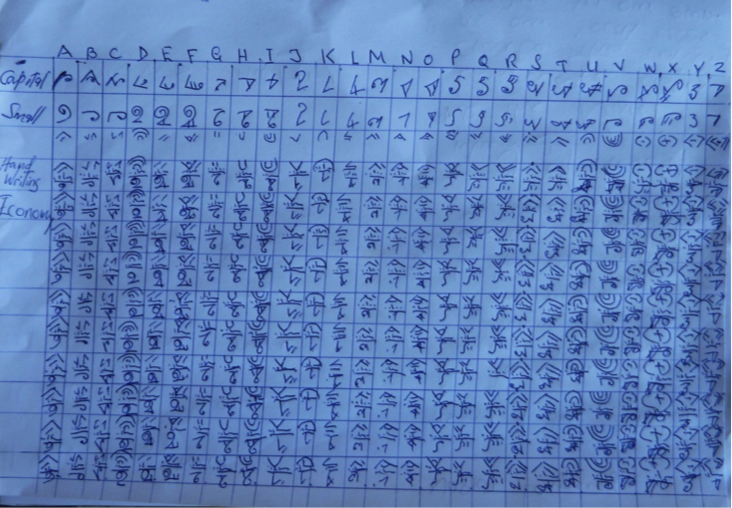 Few details about Ottomaung alphabet—its history, vitality and the extent of its manuscript corpus—are known to outsiders. To the best of my knowledge Ottomaung was developed and promoted by a cultural movement of Kieta district during the Bougainville Crisis of 1988-1998, and is used for representing the Naasioi language. The existence of the script was reported to me by a Bougainvillean linguist in 2010 who remembers seeing it used during this time. She had witnessed it being taught in some schools and saw it displayed on T-shirts but she could not recall the location. According to a personal communication from James Tanis, the former president of Bougainville, the script was used by members of a cultural movement during the blockade (1990-1998) as a means of recording stories, music and dances. The script became part of the school curriculum in Kieta district up until third grade. During this time the Bougainville Revolutionary Army (BRA) denounced the movement as a cult and began persecuting them, prompting Tanis to intervene on their behalf. 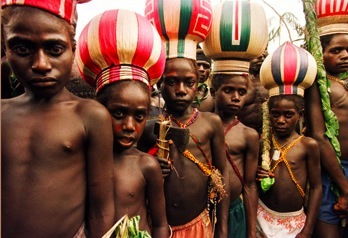 Members of this group performed a dance at the signing of the Bougainville Peace Agreement in Arawa on 30 August 2001. The Bougainville Peace Agreement. 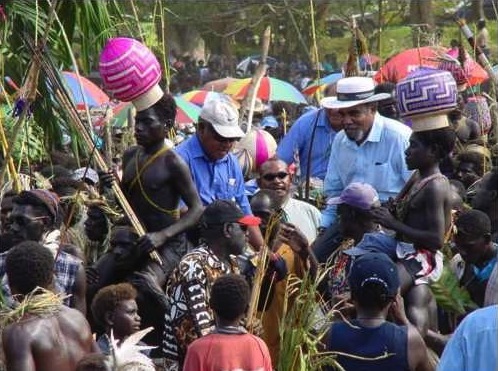 Prime Minister Mekere Morouta is in the wide-brimmed hat. Those with the coloured head-dresses are presumably members of the cultural movement that developed the script. Image from NZDF. Mi manki Bougenvil, na mipela adoptim owned Currency (moro, tero [? ]), owned Lunar Calender, owned Alphabet, ABC, and activate, Nasioi Literature. Em wanpla gutpla nius blo Bougenvil. Bai mi emailim yu yet. Thankyu. Wanem taim mi free bai mi email. Translation: I am a young man of Bougainville, where we have adopted our own currency, lunar calendar, alphabet and (active?) literature. It is a good story from Bougainville. I will email it to just you. Thank you. When I am free I will email you the story. Translation: I went to Rigu High School and my father is a knowledgeable man on culture, alongside Damien Dameng. I have compared the white bible and the black bible and have concluded some good things – things that would help today’s man. Tampara. Thank you very much […] for your notice, hope you are aware that we also adapted our own writing, like letter A is pronounced as ottomaung [? ], and letter B as miru originated from Lord’s prayer [? ], but totally different style of writing, that also goes to numeric symbols, etc. I could send you a e-mail if you are interested, so that you have a clear idea and link us to the right computer science personel or computer programmer. Tampara mung [good night]. I contacted Tamiung by email on 12 November 2012 but received no reply, then got distracted with my thesis which I submitted a few weeks later. I reestablished contact with Steven in 2014 and we have maintained an intermittent correspondence. Attempts to discuss the Ottomaung script via intermediaries were curtailed by the recent visa blockade on Australians visiting Bougainville. Steven Tamiung has sent me the following image as a starting point for developing an Ottomaung font. Since correspondence is difficult, I have been unable to establish the meaning of ‘Capital’, ‘Small’ and ‘Handwriting Economy’, nor the rules for using these registers, combining letters, orientation etc. At a best guess, this is a left-to-right system with an uppercase, lowercase and ornamental case that combines the upper and lowercase graphemes separated by a medial line and five dots. Given that Ottomaung is an alphabet, the keyboard input should be very easy. I would be very pleased to make contact with a typography student who wishes to design this interesting font, and to be recognised as the designer in the font documentation. I will be happy to send any drafts to the Naasioi community for feedback.